I don't have many screenies yet, but I'm getting more everyday. I hope you enjoy the ones which I do have so far. Feel free to neomail me to comment on them. I appreciate ratings, good and bad. Go ahead, be harsh. Tell me how I can improve. 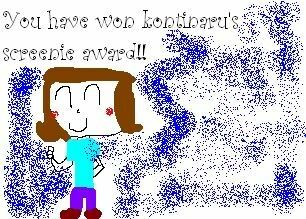 I don't have many awards. I havn't got any fanmail or anything like that. Therefore this section is nearly empty. How lonely this one award is. I feel sorry for it. And I'm sure if it had feelings, it would feel sorry for me.